Out of stock at this time. Please e-mail or phone for availability. US Radiator aluminum radiators are made to bolt in exactly as a factory replacement radiator would. The top neck is 1 1/2" diameter and the lower neck is 1 3/4" on the passenger side. The core measures 16.5" tall and 21 1/2" wide. It has two rows of 1" tubes on 7/16" centers. An internal automatic transmission cooler is built into the radiator. The transmission cooler fittings are 1/4" pipe thread. All US Radiators can be ordered with a fan shroud, electric cooling fan and thermostatic fan control. The top tank of the radiator can be polished to show off the modern aluminum look. . It can be ordered with the mounting straps in the V-8 position to move the radiator behind the radiator support. This particular radiator can be ordered in a variety of configurations to suit your cooling needs and your budget. Protects your cooling system from corrosion. A zinc annode pressed into a 1/4" pipe thread fitting attract corrosion to keep it away from the rest of your cooling system. Can be installed into radiator or engine block. 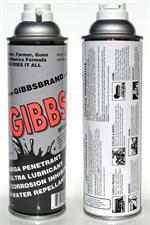 Gibbs Brand Penetrant does way more than penetrate through rust. When applied to various clean metals (such as aluminum radiator tanks) it will prevent oxidation from making your shiny aluminum radiator look like a boat anchor.